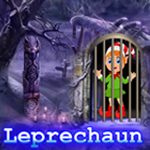 Games4King - G4K Leprechaun Rescue Game is another point and click room escape game Developed by Games 4 King. There were some homes in a beautiful gorge. It was so beautiful to look at. The temperature in the snow is very low. There is a Leprechaun in a beautiful home. It is your duty to save the leprechaun from where you are kept. It will help you find the hidden clues to save that leprechaun. Find the tricks and congratulate the leprechaun and win the game. This game is highly desirable. Good luck and have a fun! good game, not hard but fun. That 8 coloured ball puzzle (4 x 2) was tough! I hope the other colour puzzles are a bit easier. That colored ornament puzzle is cruel and unusual punishment. It sucked all the fun out of the game! Why ruin a good game with such a ridiculous ornament slider like that...redX. Thanks G4K, nice game. Happy New Year! The ornament slider was a doddle.